As we get older, time tends to move at a very different pace. In our youth, a football season seemed to last a lifetime, so did the school day and the six weeks’ holidays and the wait for Christmas was agonising. Now nine months seem to pass in no time at all, possibly because most of us now have a lot of regular stuff in our lives, like endless hours watching the kids at dance or football practice, skilfully avoiding household chores and getting irritated by stuff our partners do that really have very little consequence. All these things help fill in the voids around Leeds games very easily. Indeed, with Leeds United we are somewhat cheated, because routinely the football season only really lasts until Christmas, and the rest of the time we spend thinking about the next one. 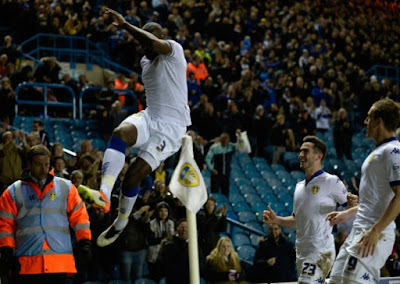 But nevertheless, we chalk off the first few games, soon enough it’s the new year and before you know it you’re waving off the season in a haze of beery regret, wishing you had savoured it properly and that Leeds United could have done a bit more by way of creating something memorable during it. It seems pointless analysing the season just passed and the current state of Leeds United too much, because there is so much up in the air with regards the governing of the club and how things might pan out for next season, and in essence the Old Peacock really acts as a form of escape from the everyday drudgery and pain that currently encompasses life as a Leeds fan. Judging by the contrast in atmosphere in the pub before most matches and then ten minutes later inside Elland Road itself, it’s fair to say that the pub is more successful in reminding Leeds fans what being a Leeds fan is all about, than the football club itself. Nevertheless, it has certainly been another campaign that never really got started for Leeds United. Back in sunny August it was hard to recall a season that had been ushered in with more optimism and enthusiasm. While we still appeared to be a few players short, there had been genuine investment in the team, no star players sold and there was structure and a sense of cohesion about the club. Sadly, that had all unravelled before Massimo Cellino was able to get his Halloween costume out (insert your own Steve Evans joke here…..) and by Christmas time Leeds were fighting off relegation. Uwe Rösler was sacked after just 12 games in charge, executive director Adam Pearson left the club in mysterious circumstances and the fans were left to watch a record run of games at Elland Road without a win, through their fingers. Steve Evans wasn’t a popular appointment to replace Rösler, but he has at least managed to get results while playing a brand of football that only a mother could love, and in truth Leeds have never truly looked like being drawn into a relegation battle. One of the most interesting sideshows during a season when on-pitch matters have routinely failed to inspire, was when the Peacock gained brief notoriety as a result of Massimo Cellino’s comments in the Italian media. Cellino referenced the pub as a competitor taking business away from Elland Road’s beer sales, and used it as justification for his infamous ‘Pie Tax’ levy on tickets in the South Stand. While we briefly considered a playful pie promotion on match days in response, we quietly got on with our business throughout all the fuss, as we have since 1824, we should add, and it certainly didn’t harm our beer sales. It’s fair to say it’s been pretty meagre fare at Elland Road for much of the season; just seven wins in the league from 23 games, and we even walked away from some of those with the conclusion that root canal surgery would have been preferable. Having said that, some of those ragged wins and anti-climactic draws have been peppered with some spectacular goals, and we have been treated to some rare glimpses of class in amongst some of the decidedly average performances this season. Alex Mowatt hit a beauty to stun Cardiff and record our first home win since dinosaurs roamed the earth back in November. 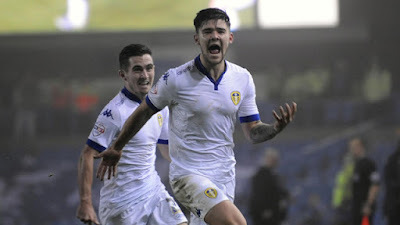 Lewis Cook struck one from even further out in the 1-1 draw with Fulham and even captain Sol Bamba recently got in on the act, netting a crisp half-volley in the 2-1 win over Wolves, which was one of very few home games that could legitimately be described as ‘entertaining’. Still, we have generally maintained an upbeat stance at the Old Peacock, and in amongst the madness that continually encircles Leeds United and while we wonder whether the club’s season ticket pledge for next season will result in the investment in the team it undoubtedly needs, we have once again enjoyed your company pre and post-match for every home game this season. We kicked off in August with our new beer garden marquee and there is no doubt it has been a great success in getting Leeds fans served much quicker, reducing queues and stress levels and generally creating a nicer, more comfortable atmosphere. We have been blessed by decent weather on most match days, so a lot of fans have continued to drink outside, although the day the marquee nearly blew away in a gale was a particularly challenging one for all involved. We hope you agree that the marquee has been a welcome addition and we are always happy to hear your feedback on what we can still improve, so let us have your comments direct to staff or via our Twitter and Facebook pages. Match days at the Old Peacock are a huge undertaking, and a lot of planning goes into making them run smoothly. We have to temporarily re-house a lot of furniture, we have to suspend our normal food menus for the day, we make sure we have enough staff on all the bars throughout the site, and enough security staff on the doors and of course we have to make sure there is plenty of beer on tap. Anyone who has experienced an Old Peacock match day will testify it is a pretty unique experience, and while it is definitely a mad few hours for all of us involved at the pub, we wouldn’t have it any other way. And let’s also not forget, we’ve had quite a lot of practice. While we have a few plans in store for next season already, we also have the Euros kicking off in June, our Family Fun day at the end of May and of course our weekly food events will be continuing throughout the summer. So even though the football is over, there are still plenty of reasons for making the Peacock pilgrimage. More about our plans for the Euros in next months’ blog post, but the Family Fun Day will be on us very shortly. It’s often difficult to think of a way to entertain everyone on a Bank Holiday weekend, so we’ve done the thinking for you. We have tried to make this an annual event now and the success of previous years will hopefully attract a healthy crowd on the next Bank Holiday weekend. There will be plenty of food and drink promotions on the day and all sorts of games and events for all ages. 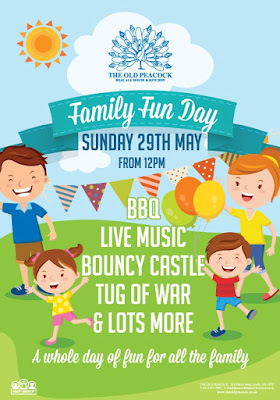 Entry is absolutely free from midday on Sunday May 29th, so come along, bring the kids and enjoy our hospitality for the afternoon. That’s all for now. Thanks again to all Leeds United fans for your custom, support, impeccable behaviour and for generating such an amazing atmosphere throughout the season. We hope you can stop by over the summer to come and see us.